PhatPad is a colorful amalgamation of tools for handwriting recognition, note sharing, and mind-mapping. Great for casual brainstorming sessions and collaborative meetings, PhatPad accurately transforms sketches and handwritten scribbles into precise shapes and digital text. PhatPad is great at helping clients and coworkers express ideas through collaborative sketches and diagrams. 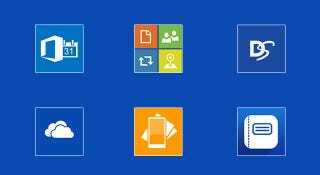 Saved ideas are stored in OneDrive and can be exported to common file formats for easy access on your phone or desktop. Work Notes Pro is a simple and powerful mobile note-taking application that keeps local tablet and phone notes in sync with OneDrive. Work Notes Pro really shines when capturing and sharing rich media files, like audio notes from a meeting, video of a conference speech, or snapshots of business cards. A highlight is that this app helps you better understand your documents by creating nifty visualizations of the data it stores. This data can be synced with OneDrive and shared with team members and colleagues. That three-course dinner with your client went great, but now you're desperate to file a wallet-full of receipts and have no idea where to find a scanner. Allow Handyscan to help: it's a slick document-scanning application that can eliminate the need for a bulky machine. It creates high-resolution scans of documents like handwritten notes, signatures, and receipts. Saved docs are cleanly organized and easily accessed, and tweaking settings like resolution and zoom is a breeze. Handyscan lets you share and export to common formats, and it syncs with OneDrive for quick access everywhere. Being your own boss means running from meeting to meeting without time to grab lunch, let alone email a proposal to a prospective client. But OneDrive integrates seamlessly with Microsoft Office, making it easy to create a detailed proposal during a meeting, add notes from your phone on the way home, and finish the document in Word on your desktop. Your formatted changes and notes will sync across all of your devices, making it simple to share a final copy with a client. Getting a contract signed and delivered is a tedious and time-consuming process, but a necessary one nonetheless. DocuSign has been working on digital signature technology for over a decade, creating a platform solution that manages the entire workflow of contract creation. DocuSign imports docs stored in OneDrive and other cloud platforms, and allows users to sign contracts, monitor the status of projects, and securely access important documents on a range of mobile devices. Work should be satisfying and fun — which it most certainly isn't, if you have to spend most of your time deciphering your own handwriting and hunting down brainstorm notes. Let OneDrive manage your time-killing business chores so you can get back to the business of having a blast being your own boss. Dan Patterson is a broadcast and digital journalist. This post is a sponsored collaboration between OneDrive and Studio@Gawker.